Service is everything to me! I believe in always putting my clients needs first, I strive to provide the service and attention I would want and expect for myself if I were buying or selling real estate. I try to always be available as “time is of the essence” in this market. I am an accomplished sales strategist and solution-oriented person, who thrives in challenging, fast-paced environments where my performance directly impacts the bottom line. In addition, I have solid organizational and negotiation skills that make a strong contribution to my clients real estate transaction needs. EXPERIENCE- 12+ years of productive representation of sellers and buyers in the Idaho and Washington real estate markets since 1980. 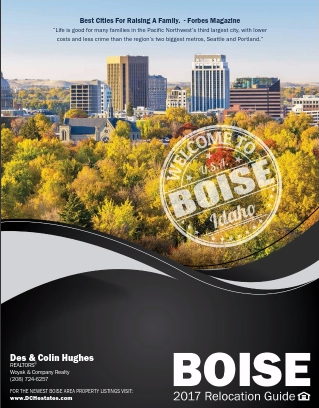 I have been actively licensed in Boise for the last 9 years. 3 years prior to that, I was the marketing director and transaction coordinator for one of Boise’s top realtors. EDUCATION-Associate Broker (AB), Accredited Buyer’s Agent (ABR), Graduate of Real Estate Institute (GRI), Certified Residential Specialist (CRS), (CNE) Certified Negotiations Expert, National Association of Realtors (NAR). Education and staying on top of the most current marketing strategies, trends, sales techniques, laws, and information that will benefit my client’s best interests is my constant goal. RESULTS- Acknowledged for consistent annual multimillion-dollar sales. On an average my listings have sold in less than 45 days on the market. This demonstrates consistent marketing and constant visibility.